The North London rivals had it easy but Chelsea were made to work hard by Leicester! 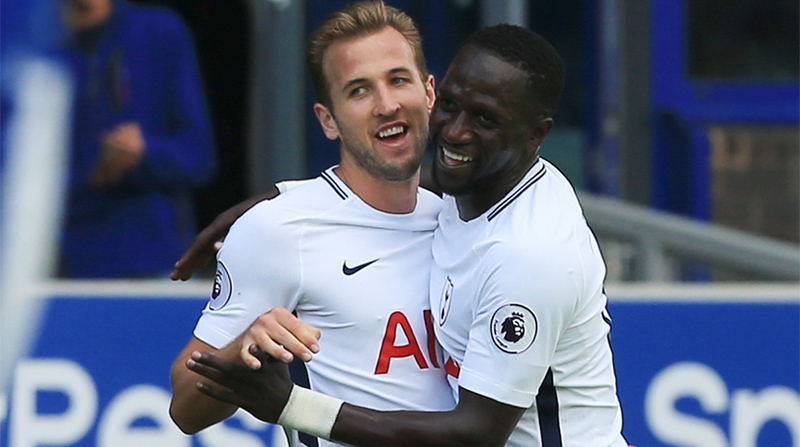 Harry Kane netted his 100th goal for Tottenham Hotspur as the Lilywhites cruised to a 3-0 win at Everton on Saturday in their Premier League fixture at Goodison Park. The reigning Golden Boot winner, scoreless in Spurs’s three games in August, opened the scoring somewhat fortuitously when his cross deceived Jordan Pickford two minutes before the half-hour mark. Spurs, playing with a three-man defence for the first time with summer signing Davinson Sanchez making his debut, started slowly but grew into the game and made their dominance count with a vital breakthrough. Emboldened by the opener, Spurs took control of the game and started to dictate the tempo and doubled their lead after some good work from Dele Alli on the right wing. The midfielder swung in a cross for the overlapping Ben Davies to take a swing at and while Pickford made a vital stop, Christian Eriksen pounced on the rebound to effectively put the result beyond doubt three minutes before the interval. Alli could have made it 3-0 barely minutes later, when Kane’s cross from the left found him unmarked but the young midfielder over-complicated matters when a simple side-foot would have sufficed. After the interval, Everton seemed to be in a stupor for Spurs scored their third within seconds of the re-start. Davies’ low cross was deftly put in the back of the net by Kane and a shellshocked Goodison Park couldn’t believe what had just happened. With a Champions League tie against Borussia Dortmund in midweek imminent, Mauricio Pochettino took off Christian Eriksen in the second-half but he could have changed his entire team and Everton could not have mustered anything of note, such was the poor state of their attack. Ronald Koeman will be battling to save his job in the coming weeks for the Toffees seem unable to beat teams that are contending for the Champions League spots. For Spurs, who are yet to concede away from home, Saturday’s result gives them some impetus to approach their tie against Dortmund and they will look to continue their climb up the Premier League table after moving up to fifth. Danny Welbeck scored a brace and assisted the other goal as Arsenal beat Bournemouth 3-0 to relieve a bit of pressure from beleaguered manager Arsene Wenger’s shoulders. Welbek opened the scoring after Sead Kolasinac made a barnstorming run on the left flank and delivered an inviting cross for the striker to head home as early as the sixth minute. Wenger had opted to put wantaway winger Alexis Sanchez on the bench and in his absence, his teammates raised their game to give their fans something to cheer about. Alexandre Lacazette, the club’s record signing, doubled the hosts’ advantage with a clinical strike from 20 yards out in the 27th minute and Welbeck put the game beyond doubt with another goal in the 50th minute. The Gunners, winless in their last two games, ascend to ninth in the table with their win over the Cherries, who drop to 19th with their fourth loss on the trot. Defending champions Chelsea went into a two-goal lead via a header from Alvaro Morata and a long-range strike from N’Golo Kane before a Jamie Vardy penalty ensured a nervy end to what was ultimately a 2-1 win for the Blues at Leicester City. Islam Slimani missed a chance to put the hosts into the lead and the 2015-16 Premier League champions paid dearly for the African’s miss as Morata scored his third headed goal of the season after Cesar Azpilicueta found him unmarked inside the box with a brilliant cross. Morata’s goal, four minutes before the interval, would prove to be crucial as the game became more open in the second period with Leicester chasing an equaliser. N’Golo Kante, a vital part of Leicester’s title-winning side, then surprised everyone at the King Power Stadium with a strike from distance that kept low and beat Kasper Schmeichel from 35 yards in the 50th minute to seemingly put Chelsea in the clear. The Foxes, however, didn’t give up and Vardy won himself a penalty on the hour-mark and cooly dispatched it to set up a grandstand finish. Both sides traded chances as fans were treated to end-to-end action but the Blues held on for the win and climb to third in the league table, level on points with second-placed Manchester United (who play Stoke later in the day) and a point behind leaders Manchester City.